No more fakes. This is the real deal. Friday 12th September/… Delivering unparalleled depth and diversity featuring some of the most prolific artists of all time including Jimi Hendrix, The Doors, Van Halen, Metallica, Ozzy Osbourne, Michael Jackson and more, Activision Publishing, Inc. (Nasdaq: ATVI) today revealed the highly-anticipated full set list for Guitar Hero® World Tour, the definitive rock ‘n’ roll music videogaming experience. Spanning over 40 years of rock history and featuring 86 tracks, comprised entirely of master recordings, the game will deliver Guitar Hero® fans the largest selection of on-disc music in the music-rhythm videogame genre to date. When the house lights go down this autumn, a new generation of guitarists, drummers and fearless frontmen will come together and rock with Guitar Hero World Tour. 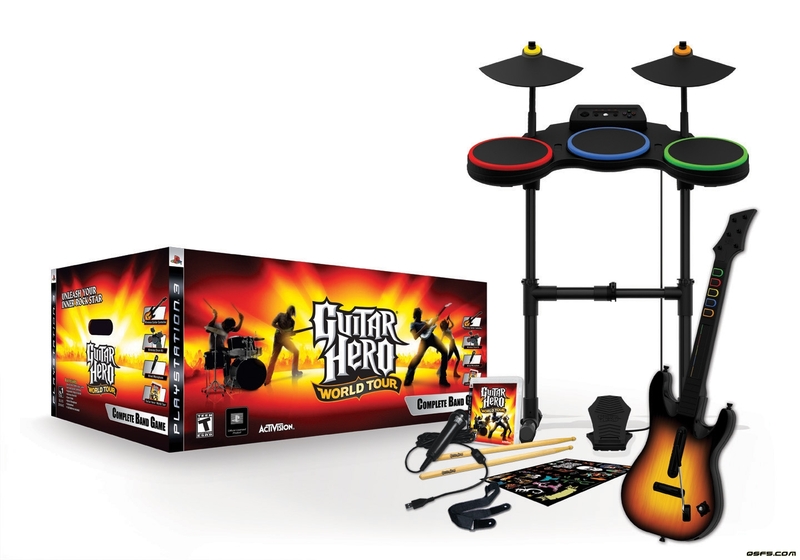 The latest installment in the #1 best-selling video game franchise of 2007, Guitar Hero World Tour transforms music gaming by expanding Guitar Hero’s signature guitar gameplay into a cooperative band experience that combines the most advanced wireless controllers with new revolutionary online* and offline gameplay modes including Band Career and 8-player “Battle of the Bands,” which allows two full bands to compete head-to-head online for the first time ever. The game features a slick newly redesigned guitar controller, drum kit controller and a microphone, as well as an innovative Music Studio music creator that lets players compose, record, edit and share their own rock ‘n’ roll anthems. Music creators will also be able to share their recordings with their friends online through GHTunesSM where other gamers can download and play an endless supply of unique creations. Guitar Hero World Tour is being developed by Neversoft Entertainment for the Xbox 360® video game and entertainment system from Microsoft and PLAYSTATION®3 computer entertainment system. The Wii™ version is being developed by Vicarious Visions. The PlayStation®2 computer entertainment system version is being developed by Budcat. The game is rated 12+ by PEGI and 12 by the BBFC. For more information on Guitar Hero World Tour, please visit www.guitarhero.com.